We are very proud of our woocommerce product feed manager and we think it is the most powerful plugin out there build by feed marketeers especially for woocommerce powered shops. Our plugin will help you to get the most out of your product feed. How does woocommerce product feed manager work? Basically the plugin will generate a xml product feed valid for the merchant channel you choose. It will take the data from your woocommerce powered online shop and create a valid product feed. The data feed is uploaded and synced to the merchant channels of your choice like google, bing, facebook, amazon, etc so that the product you sell show up on their shops and search engines. So with the use of our plugin you are able to increase your exposure and sell your products on many more channels. Say we charge €40/hour, we are only charging you for max 3 hours of our effort. In exchange, you get a complete product feed management software, with a solid codebase and with advanced features with 1 year updates of all supported channels. We also constantly add new features and bug fixes, so the cost is well worth it! Compare our price with comparable hosted solutions that charge our annual price per month! Look around, try several solutions and you will understand our plugin is far superior to other solutions compared to functionality and price. Were can i download the plugin? You can download the Premium version of our plugin right after you have purchased the product feed manager plugin. You will receive an email with your product license and a download link. If you are looking for the free trail version of the Woocommerce Google Feed manager you wil find it in the wordpress repository. Click here if you would like to download it. Please click that link and login to your account. There you will see your license key. You have installed the free google version of our plugin and after a while you would like to upgrade to the premium version. If you want to keep your previous created product feed you have to manually upgrade your plugin. With the following steps you are sure you can keep working with your existing product feeds. Deactivate the plugin in WordPress. Overwrite the free plugin in the plugin directory on your server. Now you will be prompted to enter your license key. After validating the license key you will find the feeds you had created in the feed manager. Can i change the url of the shop? The license has a restriction on the url it has been assigned to. This is done as soon as you enter your license key to register your plugin. When you want to switch your plugin to a different url you will notice that the activation will not work. You can change the domain to a different license by deactivating the url and enter a new url. What are the supported feed channels? With the Custom XML and CSV Export template you can create nearly every possible channel you ever would want to have. We add new channels templates on a regular base. We add channel templates based on your requests! If you have a great plugin we do not support at the moment please contact us so we can have a look at the plugin and make it work with ours. Yes, our plugin does work on a WordPress Multi site. You will need to activate the woocommerce plugin on each shop separately. So make sure you do not “Network activate” the Woocommerce plugin in the Network admin. If you are having trouble getting license keys to activate, here some tips to help resolve common issues. Security plugins for WordPress often have features that interfere with the license key API requests. These features tend to make the activation (and other API requests) return an unexpected response, causing the activation routine to fail. To resolve the issue, simply disable the Filter Suspicious Query Strings in the URL setting. If you’re not using iThemes Security, it will be named something different, though similar. Some sites will add special rules to the .htaccess file in order to block certain IP addresses or add additional protection to the site. If you have any special .htaccess rules in place and license keys are not activated, try removing the rules and then activating license keys. If the license keys activate properly now, you will need to adjust the rules to allow the licensing API routines to function. I can not see the feed, how can i preview the feed in my browser? Before the feed manager will update the feed you have to activate the feed you want to automatically be updated. You can change the status in the Feed list with all the feeds you have setup. Click the “activate” link under Actions in order to activate the feed so it will update itself every given time. IMPORTANT NOTE: The following steps are in this specific order for a reason, so don’t skip a step not even if you’ve already done it in an earlier stage. Follow these steps until the issue is solved or you’ve reached step 11. SECOND NOTE: If you want to check if a feed really stopped generating, open the wp-content/uploads/wppfm-feeds folder (or the folder you’ve rerouted the uploads folder to) and refresh the content of this folder. As long as you see the feed file is still growing, the process is still running so wait a bit longer. If the feed stops growing and our plugins still shows “Processing”, then it failed. Open the Feed Manager -> Settings page and make sure you have the “Disable background processing” option switched off. On this Feed Manager -> Settings page click the “Clear Feed Process” button. Then try regenerating your feed again. If that does not work, open the plugins page and deactivate and reactivate the plugin. Then perform step 3 again. If that did not work, open the Feed Manager -> Settings page and de-select the “Disable background processing” option. Open the Console Tab of your browser (see below on how to do that) and check if you get any error message in the console whilst generating the feed. If you see any error message there, make a screenshot and send that to me. If you don’t see any error message on your Console Tab, look for any error log file in the ‘wp-content/plugins/wp-product-feed-manager’ folder and in the ‘wp-content’ folder or in the root folder of your web server. If you find any error log file send that to me. If you can’t find an error log file, try to put your wp-admin account in debug mode (see below on how to do that) and repeat steps 3 and 8. To open the Browser Console Tab press, depending on your preferred browser: CNTRL+SHFT+J (for Chrome) CNTR+SHFT+K (for Firefox) or F12 (for Explorer). If you work on a Mac: (CMD+OPT+J for Chrome or CMD+OPT+K for Firefox). To put your wp-admin account in debug mode, edit your wp-config.php file and change the lines “define( ‘WP_DEBUG’, false);” and “define( ‘WP_DEBUG_LOG’, false); both to true. Or if you can’t find both lines, add them both just above the line “/* That’s all, stop editing! Happy bloggin. */”. See https://www.wpsecurityauditlog.com/wordpress-admin/enabling-wordpress-debug/ for more information. Let me know at what step in the procedure you solved the issue or if you’ve reached step 12 without solving it. If the price in your product feed is showing the price without the tax you can add the tax to the price using the recalculate function. Basically our woocommerce product feed manager will turn your product and data in to a valid product feed. A file with all the products from your shop including all the data about the product like price, link, image, color, type product, category, etc. With this product feed you can sell your product on several different merchant center like Google shopping, Bing, Facebook, etc. We are very proud that we have build the most flexible and powerful Woocommerce Feed Manager as to date. Our plugin stands out from other feed manager that it is build by Feed marketeers especially for Woocommerce shopping cart platform. The power of our plugin is that you can add the data from your shop to any required, recommended or supported feed attribute. 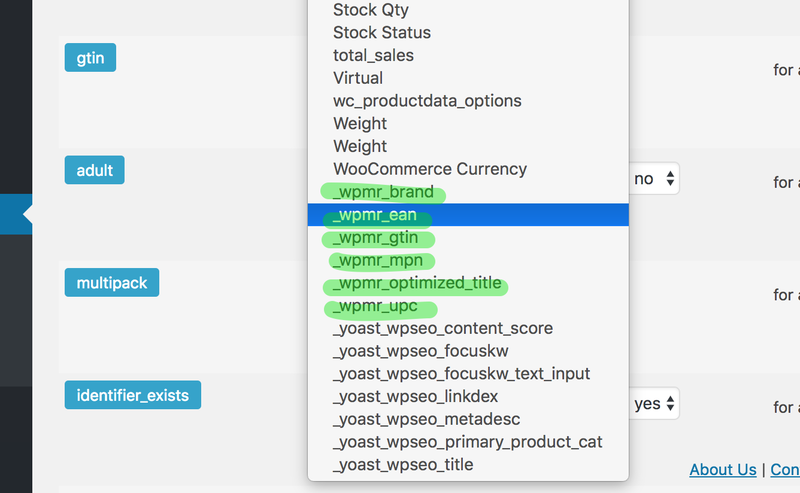 Next to that you are able to alter the data from you wordpress woocommerce database so you can optimize the data you send to Google. We give you controle about the data send to the various merchant selling platforms. You are in control and not at the mercy of Woocommerce or WordPress. How do i create a feed with individual variations? How does the condition editor works? The condition editor is really powerful and makes it possible to create in almost every situation a perfect product feed and optimize it for your shop and feed performance. In the next example we are setting up a google feed showing the sales price if it is set and the regular price if the sales price is empty. We show the sales Price in the price attribute if the Sales price is not empty OR we show the Regular price for all other products. As you can see you can create conditions really easy. Where do i find my product feed file? You will have to submit the feed URL to your Merchant center. You will find the URL to the feed in your feed manager > Feed list and click the “view” link you find on the right of the list with feeds. It will open de feed in a new browser screen. You can then copy the URL and use that URL in your Merchant center. From the navigation panel, click Products. Click the name of the feed you’d like to schedule. Click Schedule on the page that loads, and click Edit schedule at the bottom of the page. Schedule the desired frequency, timing, and location of your feed. Click Update schedule to save your changes or Update and fetch now to trigger an immediate fetch and upload of the file from the URL specified. I want to use a default brand name in my feed? I do not have a GTIN number, how can i create a valid feed? If you have products that are missing some unique identifiers like GTIN number you can tell Google this by setting “identifier_exists” to no. If you have a mixed products with and without unique identifiers you can use conditions to set this identifier_exists based on product data. The Shipping attributes can be used together with the Google Merchant account shipping settings to help Google provide accurate shipping costs in your Google ads. Learn how to set up Merchant account shipping settings. Use the shipping setting in the Feed manager only to override the Merchant Center account shipping settings for an individual item. By default we assume you will use the shipping settings set in your Merchant center. If you want to overrule these settings for some reason you can add shipping settings by choosing the right attributes in the “add optional output” dropdown. In the short how to video below i give you an example how to set the shipping price based on the regular product price. shipping price is 5,00 USD if Regular product price is les than 50 USD or Shipping price is 2,00 USD if Regular product price is between 50 and 100 USD or 0 USD for all other products. 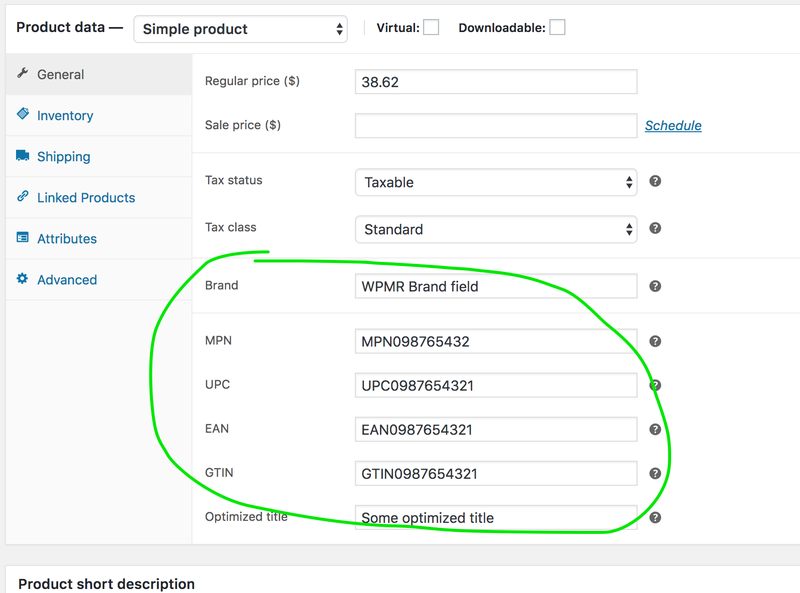 Woocommerce does not add GTIN, Brand or other Unique identifier fields to the products. Therefor we have created a little helper plugin for you so you can add those fields to your simple and variable products. step 6. Install the plugin in your WordPress Woocommerce shop like an ordinary plugin. And you’re done. You will find the additional fields in the Product data section in the general tab. For variable products you will find the fields in each variation in the variation tab. After you have filled in one of the fields for at least one product you will find the field in the source dropdown in the feed editor. Now you can start using GTIN and Brand fields in your feed.